After getting my haircut that morning, I met up with some friends on Saturday afternoon in Hongdae (Seoul). 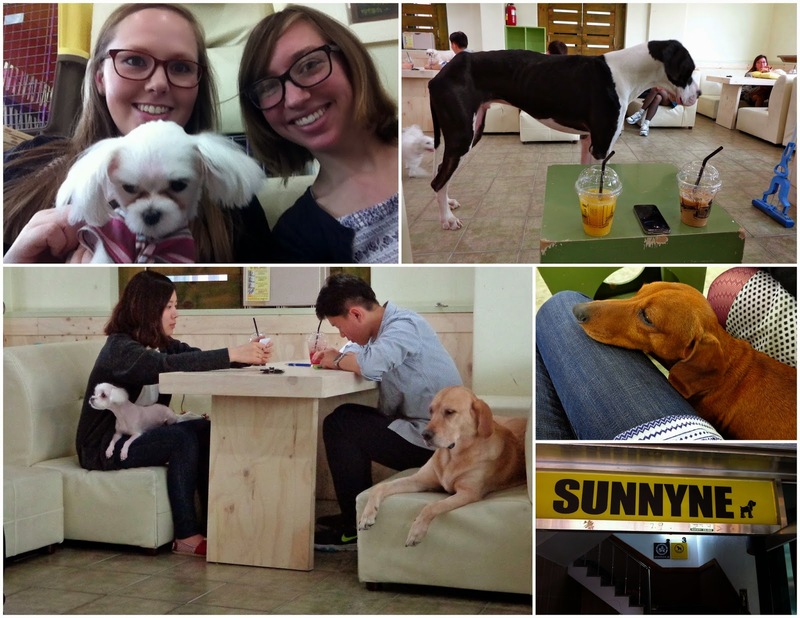 The first item on the agenda was visiting Sunnyne Dog Cafe. 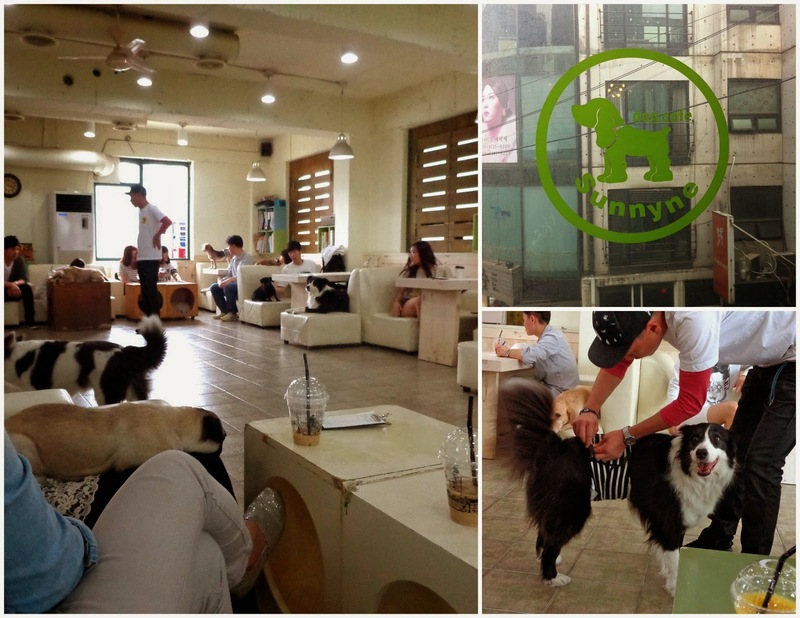 Like the cat cafe I went to last fall, this was a cafe filled with dogs freely roaming about! I love dogs, so I've been looking forward to visiting a dog cafe for some time now. Before we walked in the front door, we were instructed to read a sign that said in broken English "Open gate and sit down on bench". Umm, okay. We weren't sure what to expect after reading that sign, but as soon as we entered the barking ensued. All of the dogs gathered to the gate and we quickly pushed our way through to the first bench and sat down. The dogs calmed down a bit, and then we were shown to our table. 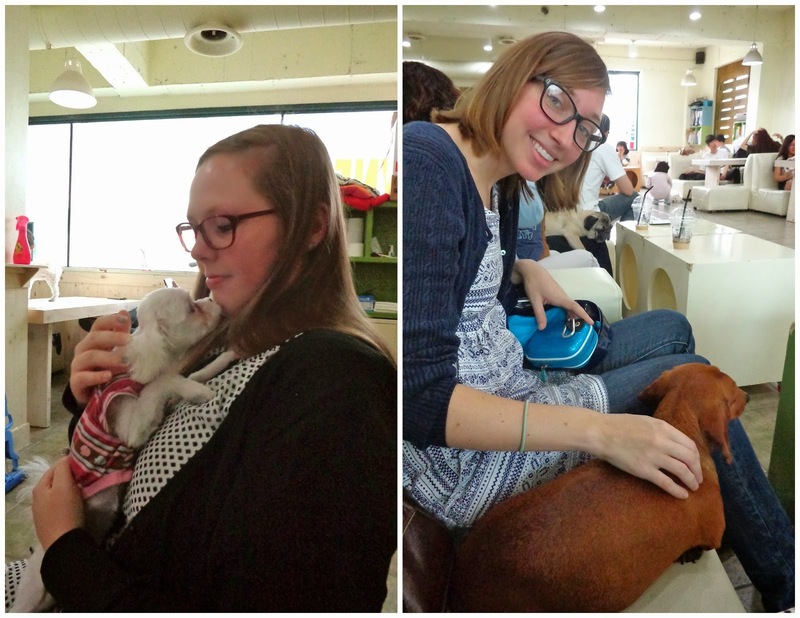 Like other pet cafes in Asia, the "admission fee" is included in the cost of your drink. There were coffees, teas, and juices, and prices ranged from W 6,500-8,000. 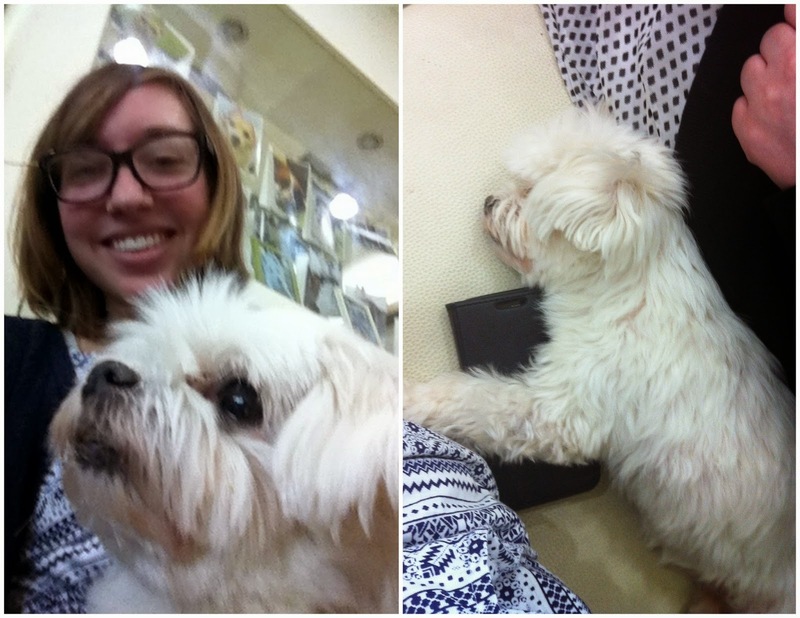 After ordering, a worker handed our single-page wooden menu to a dog, who then carried the menu away in his mouth. Too cute! A few dogs wore diapers for whatever reason, while the rest just peed right on the floor (and the workers quickly cleaned up each time). So hypochondriacs, this might not be somewhere you'd want to go, but I'll certainly go back! Tips: Look for the yellow sign when you're going to Sunnyne. Also, remember it's up on the second floor! I'm good at walking with the stone on my shoe, but when it comes time to lightly kick the shoe stone off, I always miss whatever stone I'm aiming for! I had my second grade daycare class that afternoon, and had them sing happy birthday to me along with a youtube song. When I told them it was my birthday, they were surprised - I'd grabbed their attention. Really? Today? Your birthday? And then these smiles and impressed looks came across their faces, as if I'd just performed a magic trick. They started to clap. It was so funny - I was really entertained with their reaction to my birthday. After class I had about 5 minutes before Teacher's English Club would start. 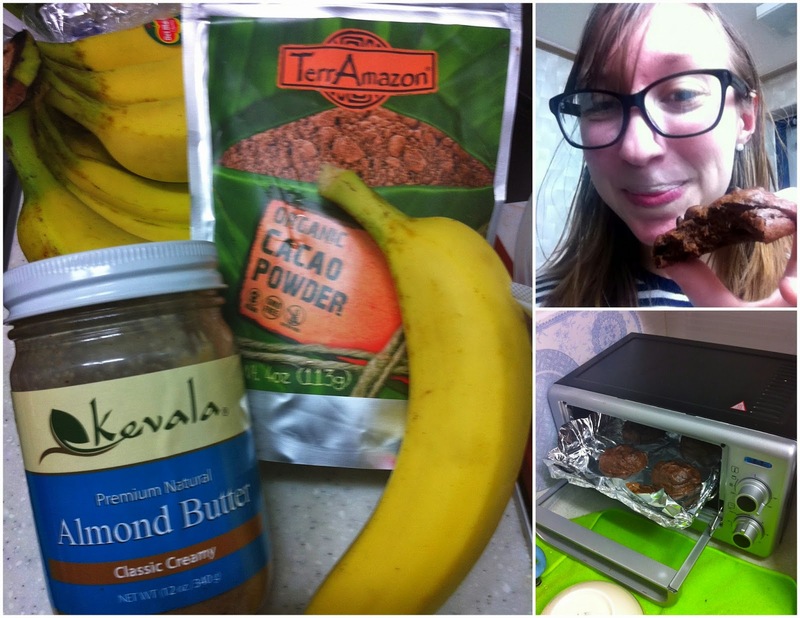 I'd brought in two packs of dark chocolates I'd bought on iHerb to share today. 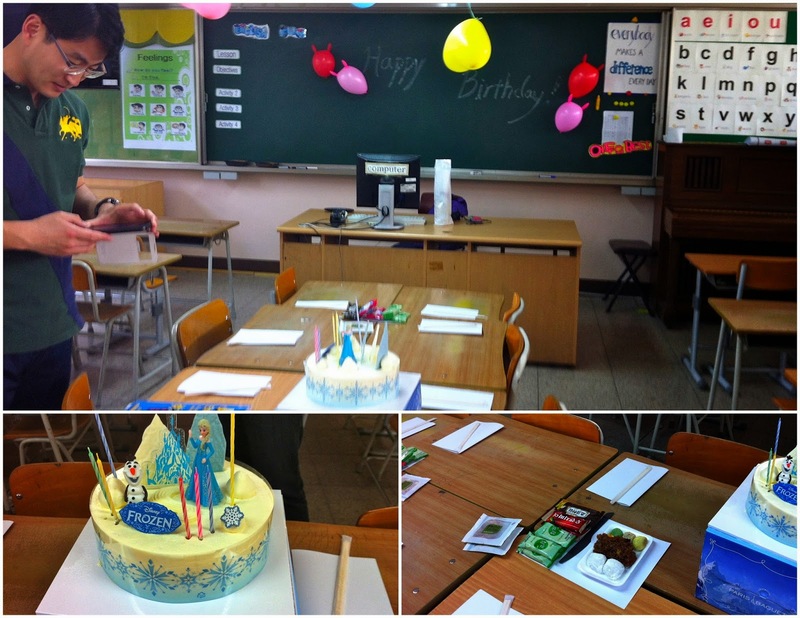 My other co-teacher YJ was in there, setting that all up, but she looked just as surprised as me when we walked in. "What are you doing here?" she asked my other co-teacher. YH brought his hand to his head and said "Oh no, I forgot!" So I think they wanted to get all the teachers there, and then surprise me -- but I was still very much surprised with everything anyway! Then the teachers started coming in quietly, one at a time, thinking they needed to hurry and get there before I did. 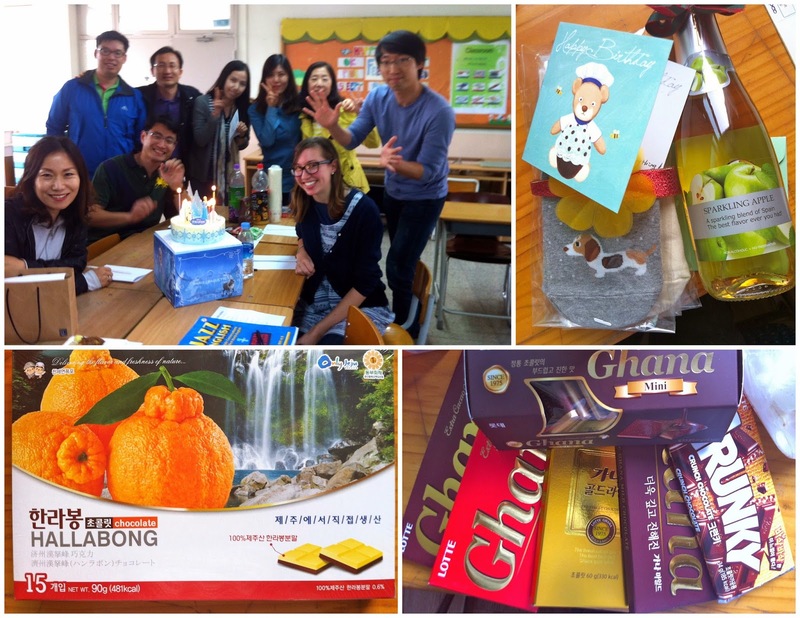 There was a Frozen cake (from the movie, not a cold cake), juice, Korean treats, nuts - lots to much on! Balloons were hanging all over the classroom and blackboard, and they played "Happy Birthday" on youtube and sung it to me again when we lit candles. Some of the teachers even brought me a gift, which was so very kind of them. My heart was just flooded with gratitude. It was the perfect way to celebrate for me, though, with a small gathering for about an hour at the end of the day and then the evening to myself. I read some awesome birthday emails while eating some of the leftover birthday cake my co-teachers had sent home with me. The day was nearly complete, but I wanted to continue my two-year-old birthday "tradition" of giving back. It started on my 23rd birthday in Madrid when I donated $23 to two organizations I support. I celebrated my 24th birthday by love lettering my community, and so in honor of my 25th I supported two projects of people I know. I met Kirke on a summer frisbee team over five years ago now, and while I haven't seen him since then, I've been following his blog. Kirke moved to Detroit in 2012 and has been bringing positive changes to his community ever since. One such endeavor is rebuilding the basketball court in Callahan Playground, a park whose better days were in the 1980s. Kirke has spearheaded this whole project, and I think his actions are so admirable. To get a taste of his efforts and a feel for the neighborhood, read about what happened the night that Kirke showed a friend the site where the basketball court will be built - it's a bit unsettling! Callahan Playground Basketball Court from Neighbor.ly on Vimeo. Here's the Neighborly page where donations can be made for the Callahan Playground basketball court. And the other project is run by Jordan Hatcher, who I met in a French class my senior year of college - her junior year. She had also studied abroad in Madrid like I had, we were both then studying French, and as I was applying for Peace Corps that spring I found out that it was her dream to serve in Peace Corps. Three years later and here I am in Korea while Jordan is serving her second year in the Peace Corps in Senegal! Right now she is raising funds to build a wall around the local school. 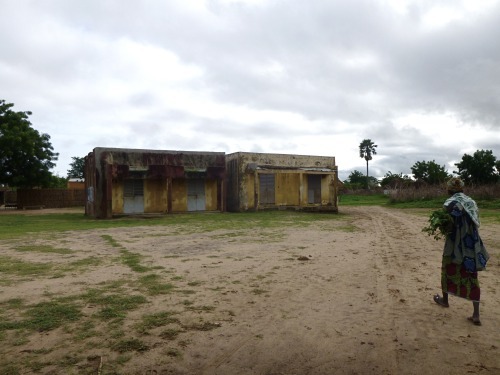 Presently, the Al Hadji Andala Wilane School is located in the center of the village with a major road running in between the school classrooms, leaving the school vulnerable to passing vehicles and livestock, and unfortunately, causing a series of serious accidents with students in the past. The community has identified the greatest need in the village as a wall that will enclose the school, protecting the students and teachers, and creating a greater sense of safety. This will be the largest fundraising project of my entire Peace Corps service, especially because I am working individually on the project. Here is the Peace Corps page where donations can be made for the Al Hadji Andala Wilane School wall project. Like in years past, if anyone would like to help celebrate my birthday by supporting these causes, donation information is above. A huge thank you to everyone who helped make my 25th birthday a very great day! I am so lucky to have such wonderful people in my life - all over the globe! We slept well with our newly-acquired earplugs on Tuesday night, ready to visit Ayutthaya (about an hour from Bangkok) on Wednesday. The vans you can take to get to Ayutthaya leave from Victory Monument, which was one of the big protest sites at the time. We read online that the vans were still leaving from there, and it was okay to take them. It was in the morning, so we felt alright about catching a van there, despite the protest site. I had read online to beware of a new tourist trick with the Ayutthaya vans: The vans will drop you off outside of the city and say that it's the Ayutthaya stop. Then you'll have to pay a tuk-tuk whatever price they name to take you into the city. The notice I read said not to get out of the van, to stay on until it reaches the last stop in Ayutthaya. I'm so glad I read that ahead of time, because that's exactly what happened! 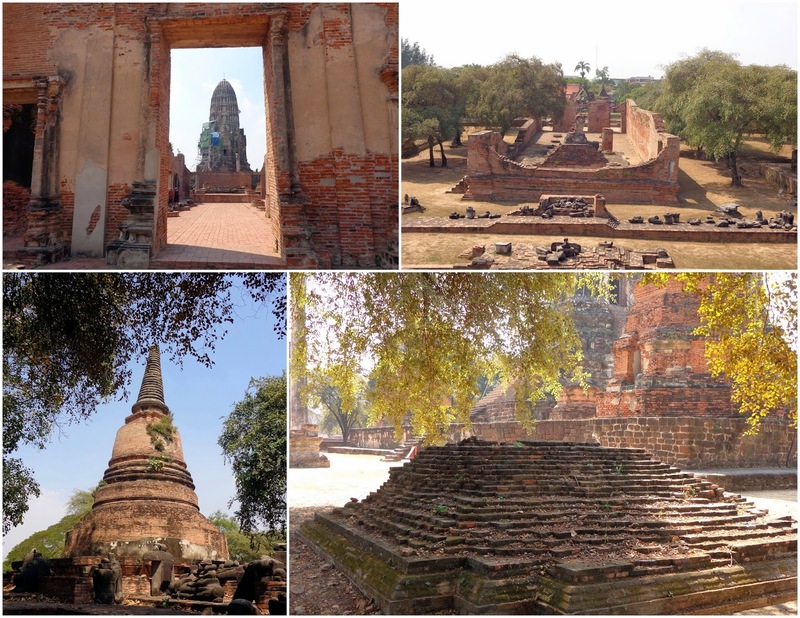 There were a few other stops along the way to Ayutthaya, and passengers in our van would tell the driver that they were getting off there as we got close so the driver knew to slow down and pull over. But as we approached Ayutthaya, nobody told the driver to stop when the van pulled over. Someone outside opened the sliding van door, and the driver looked at Anne and I and signaled for us to get off. 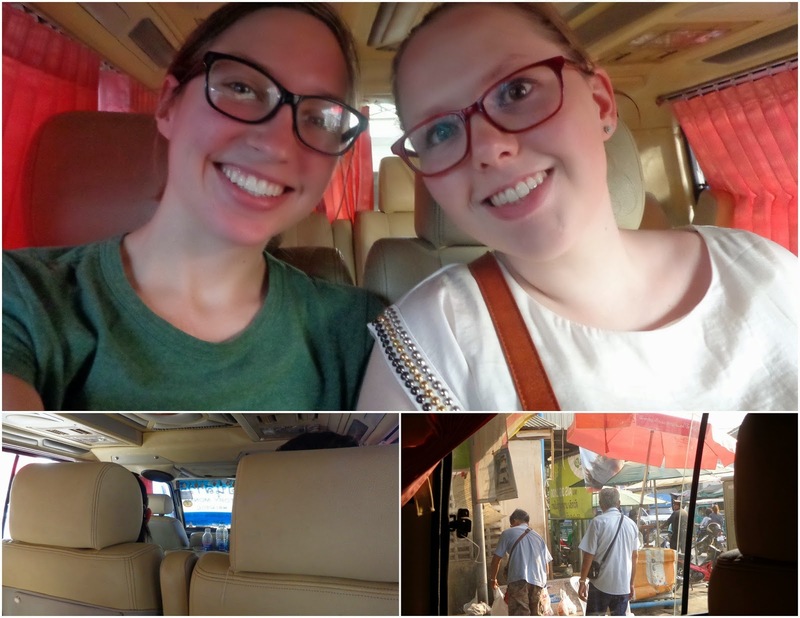 Luckily we were the only foreigners in our van, so the fact that none of the Thais got off when they pulled over and said "Ayutthaya" to Anne and I helped us stay confident in declining to get off, even though we had no idea where we were. 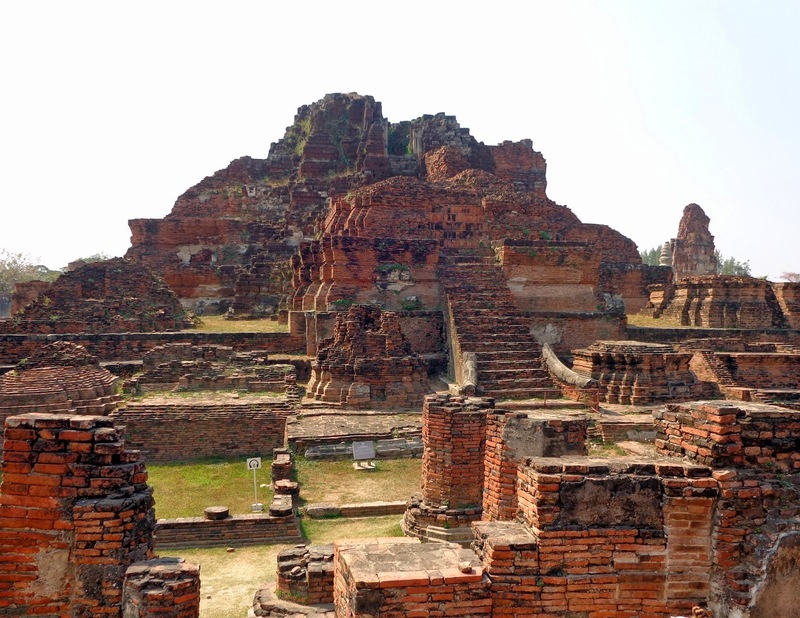 The driver looked at us and repeated himself "Ayutthaya," motioning for us to get off. We could see the herd of tuk-tuks around. So we shook our heads no and stayed seated. The driver tried one last time, and then they closed the door and kept on driving... into Ayutthaya. We got off at the final stop, which is when all the remaining passengers got off, too. Then we walked down the street to Wat Mahathat. Each temple cost 50 baht to enter. It had been a really hot day; I remember sweating a lot. After we finished walking through Wat Mahathat it was sometime after 14:00 and we were hungry. But there weren't many buildings around, and all of the nearby food stands were packing up, as they'd finished serving lunch. So we walked and walked around, not seeing any options. After a while we reached the end of a street and realized it was where we had started! There was a restaurant that was part of "Tony's Resort" which was shaded, had free wifi, and had menus in English -- perfect! I didn't care one bit that it was part of a touristy resort - we were that hungry and hot, and the prices were still very much affordable. I had watermelon juice to start, which was simply divine. By the time we finished eating it was past 16:00, and we realized all of the ancient temples closed at 17:00. So it only made sense for us to head back to the van drop-off site (a block from where we were), and wait for the van to fill up to take us back to Bangkok. 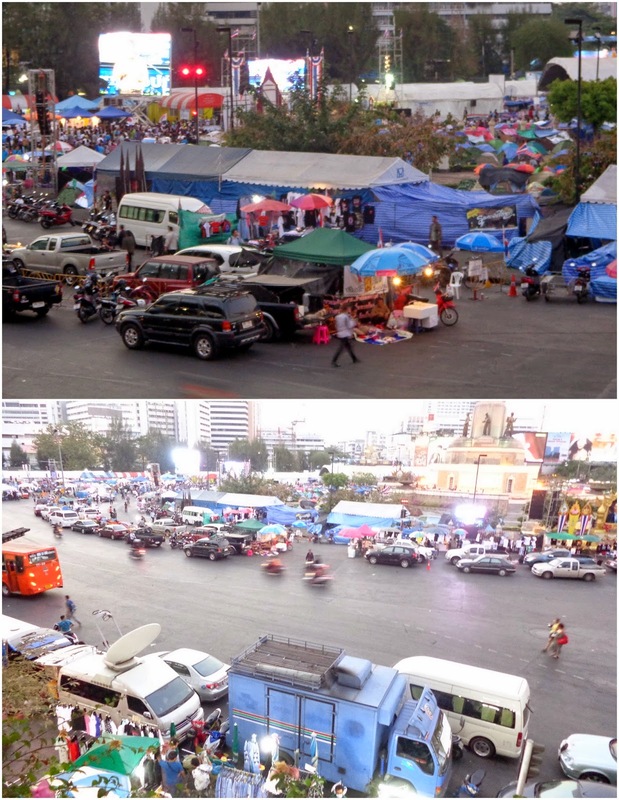 When we got back to Bangkok the van couldn't drive inside Victory Monument, as the police had blocked it off due to the protesting. We were able to climb up some stairs to get to the SkyTrain without needing to enter the Victory Monument circle at all. And that night we stayed in (I think I stayed in every night...) and had a great time hanging out with our hostel mates. I'm now over halfway through Whole: Rethinking the Science of Nutrition, and having it on my mind has changed what I've been eating these last two weeks. I also had a glimpse two weekends ago of what it's like to have a diet different from your friends. 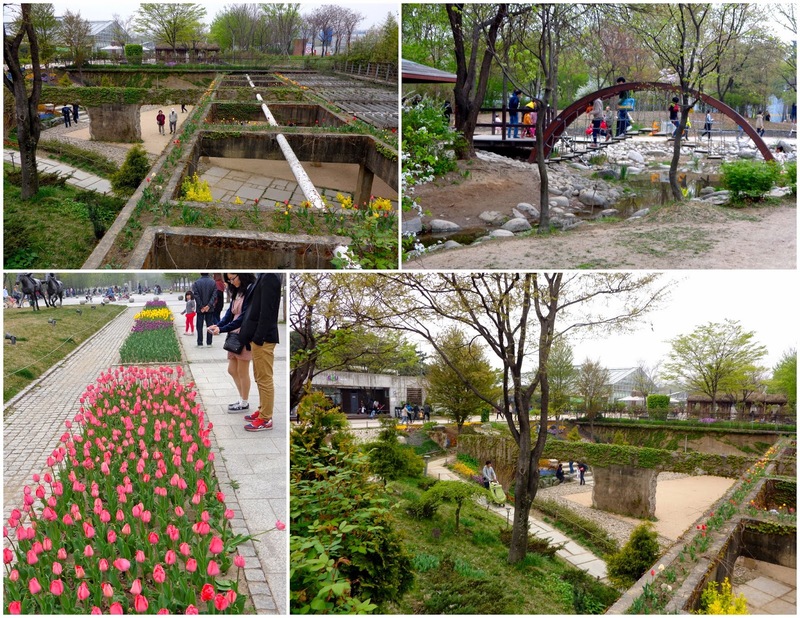 I met up with three friends in the city to walk through Seoul Forest that Saturday. One of our first stops inside the park was a convenience store to get a snack. One friend got hot chicken-flavored chips and offered some to all of us. I had to politely decline, as I couldn't even imagine letting those chemicals become a part of my body. My other two friends got hot ham and cheese sandwiches, which looked good, but I wanted to avoid the bread, processed cheese, and ham. So I got some odaeng (Korean "fish cake" with broth), a tasty warm eat for the cloudy day (although now that I think about it, I have no idea what odaeng is made of, and if I should be eating it at all). That evening when it came time to look for somewhere to eat dinner, someone saw a Pizza Hut in the distance and excitedly suggested it. Now when you're an expat, it can be comforting and a real treat to eat something familiar from home after so much time without it. I had bitten my tongue and grudgingly eaten at a Pizza Hut once earlier last fall with a group of friends. But after what I'd been reading lately, and my attempts to cut out breads: no way. So I spoke up right away and turned it down, to the group's disappointment. We ended up having a delicious Korean dinner - I had kimchi stew, and did not eat the ramen noodles that they mixed in. Lots of vegetable side dishes to munch on, too. No alcohol. After dinner on our way back to the subway, we passed another convenience store and the group decided to go in for a sweet treat. Had it been even two months ago, I probably would have bought a chocolate bar or something, but that night I bought a small glass bottle of soy milk. It was difficult to have to face what I used to purchase and not eat it, while friends were diving in right next to me. When I'm on my own during the week in my small town, I simply don't go into the convenience stores anymore. Don't see it, don't buy it. But that night I had to see the chocolate shelf up close and personal. So although I felt good about what I'd put in my body that day, I knew the hesitation and difficulties I'd experienced eating out with friends was only a small taste of what's to come. Although I've gone without dairy and have given up some foods during my years-long IBS journey, the diet changes I see myself making now (eating WFPB) will be much harder to live with socially when I'm around family and friends back in the states this fall. John has been living without eating gluten for some time now, so he has a much better idea of the types of struggles I'll face. But I know that together, we'll come up with strategies to keep eating right without giving up our social lives. 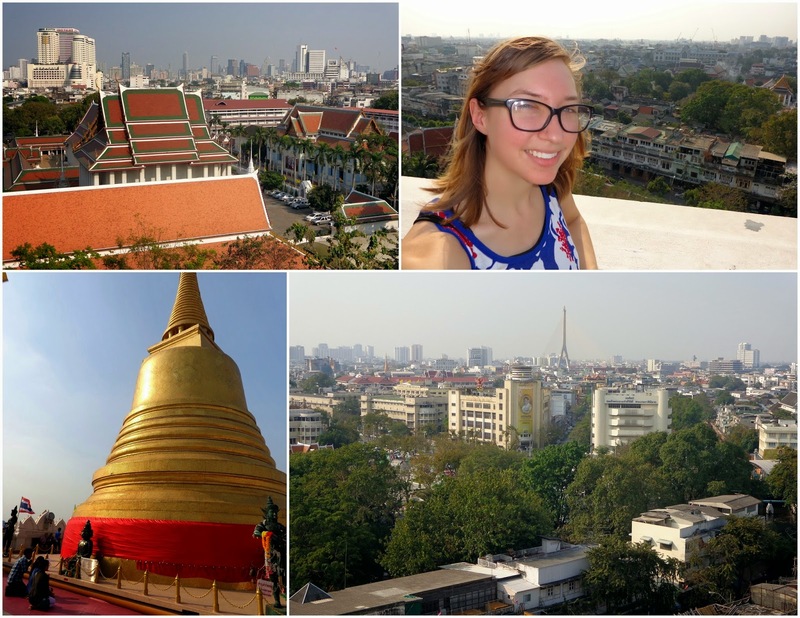 Believe it or not, we're over halfway through April and I still haven't finished writing about my trip to Bangkok back in January! 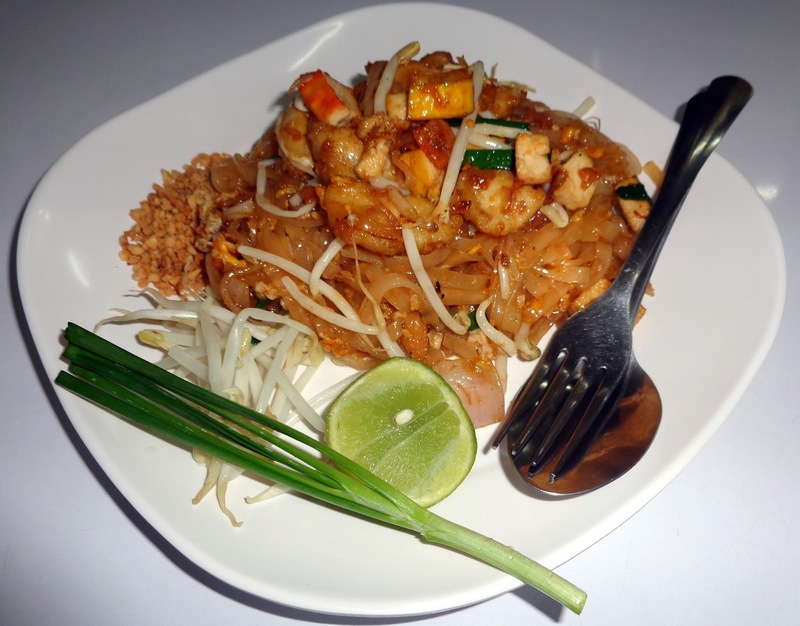 Last I wrote, Anne and I had spent most of Monday at a great Thai cooking class in the city. What I failed to mention is that Anne had been getting sick, and after a night without much sleep (noisy night at the hostel) she was feeling even worse on Tuesday. 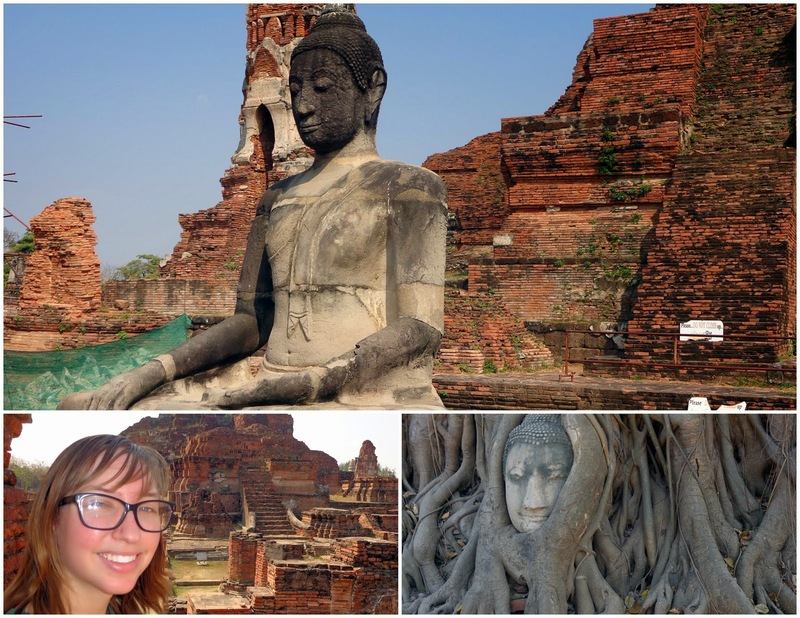 We'd planned to go to Ayutthaya that day, but quickly changed plans when it was obvious that she should stay at the hostel and rest. So I set out to do a little more wander walking. 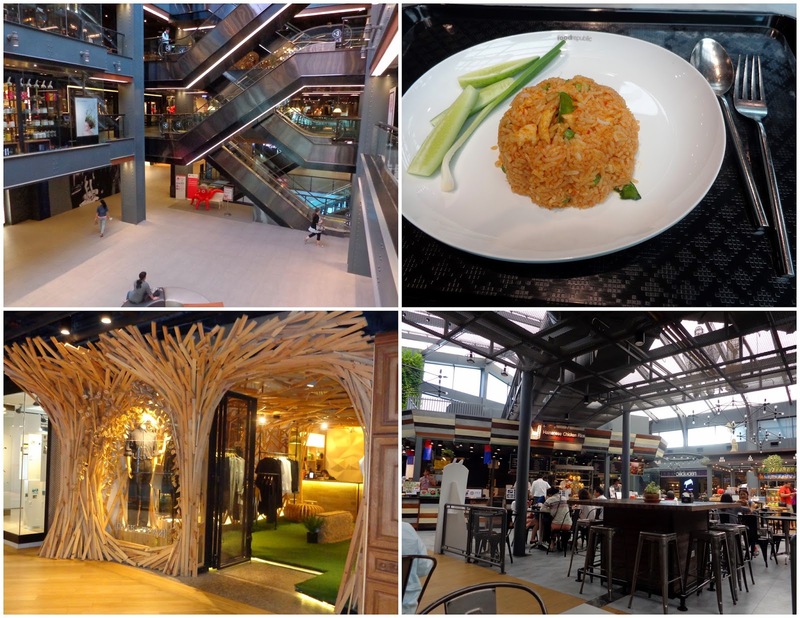 First I explored the Siam Center, a huge shopping complex, just to see it. I ate in the mall there, chicken fried curry, while reading my book. Each shop and display in the mall was uniquely decorated; this was the nicest mall I've ever been in. 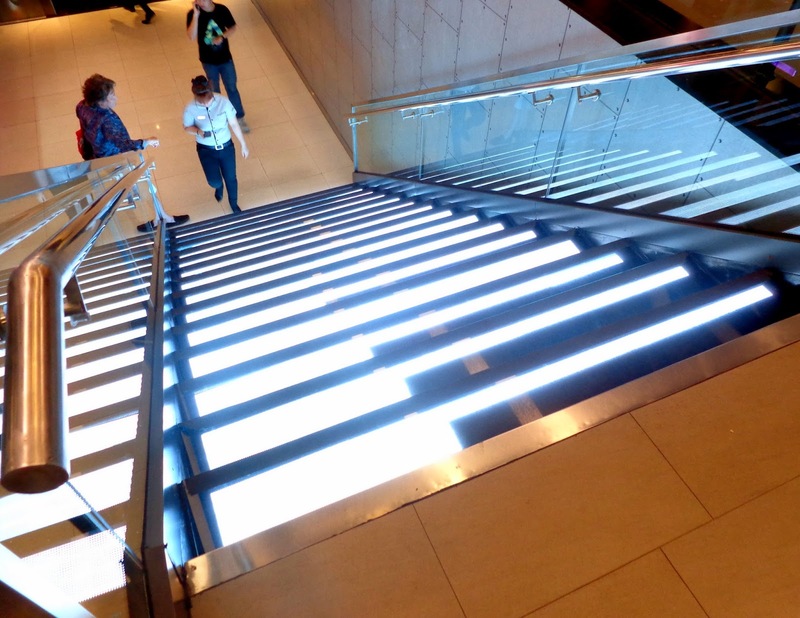 There was a real, live interactive set of piano key stairs that I walked up and down! 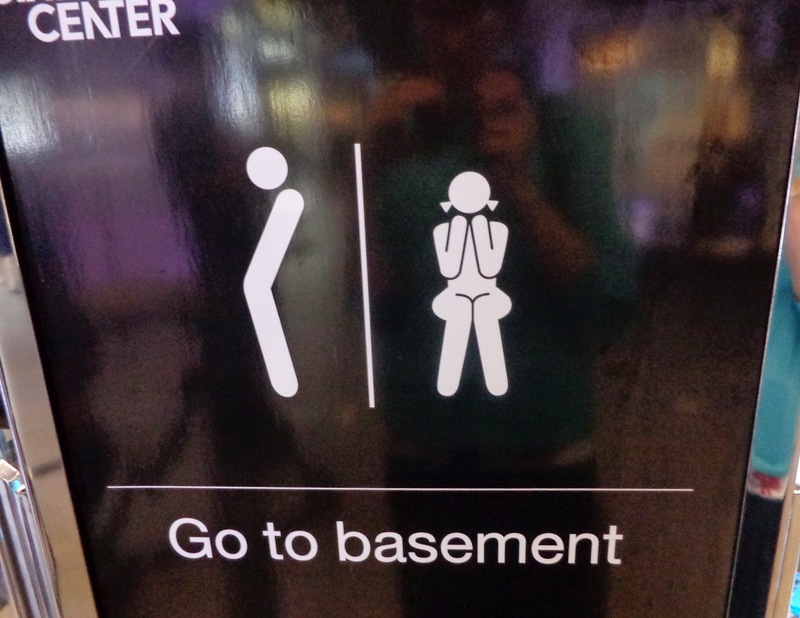 I took those stairs down to get to the mall's bathrooms, which were super hard to find because I didn't see the restroom symbol on any signs. When I got to these stairs I finally realized why I hadn't seen any signs. I hadn't recognized it on the smaller signs on each floor, since I was looking for the classic lady-in-dress-standing-next-to-a-man symbol. Then I took the SkyTrain to the same stop (S6) where I'd gotten on the ferry the other days, but decided to walk instead of taking a boat. I wasn't sure where I'd end up or how long it would take to walk where. I bought some strawberries from a small fruit stand along the street -- so delicious! This was summer in the middle of winter for me, remember. I stumbled upon a pharmacy and - using awesome gestures to explain what I was looking for - purchased earplugs for Anne and I. No more sleepless nights because of hostel roommates going in and out all night. Success! 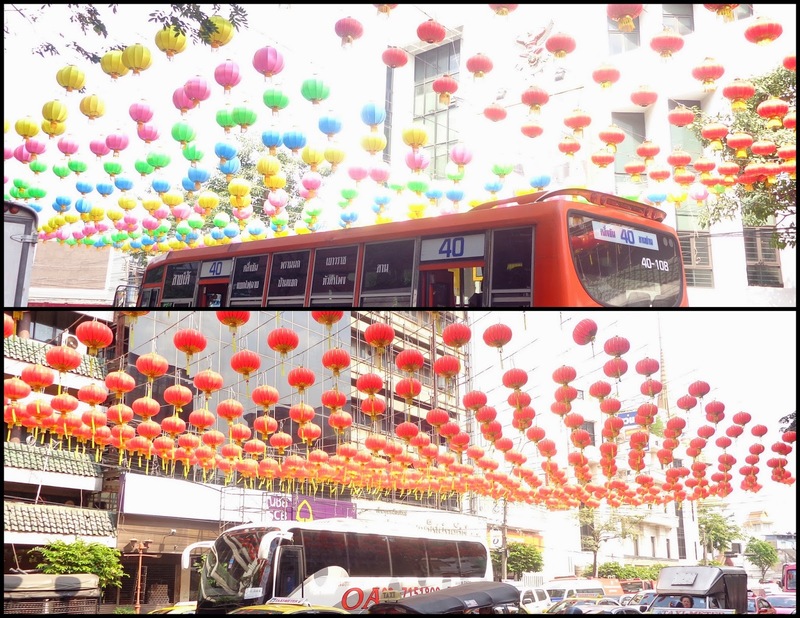 I walked through Chinatown, and saw decorations getting put up for the lunar new year later in the week. I was very thankful for my good sense of direction that day. 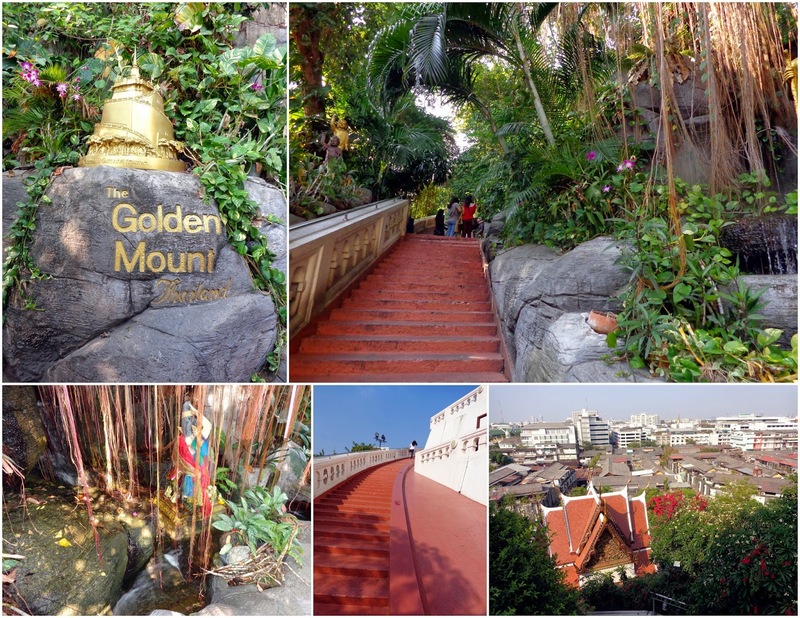 I read about the Golden Mountain (Wat Saket) in the small Bangkok book I'd borrowed from the hostel, and found it by walking and turning where I thought I should walk and turn. 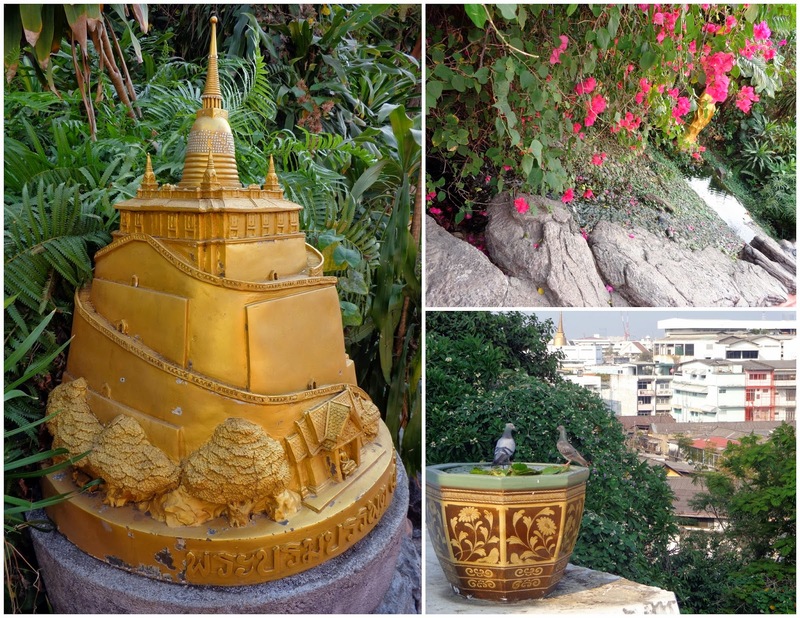 Wat Saket is a temple located at the top of an artificial hill in the middle of Bangkok, and it cost 20 baht to go up. On the way down, I saw this model of the Golden Mountain (below, left) -- so you have an idea of what this steep artificial hill looked like. When I got down, I found my way on foot past Democracy Monument, back to the river. I passed lots of closed shops and barricades on the way (remember the protests were going on), but there weren't many people around. Turns out I was near Pier 13! So I took an express boat back to the Central Pier to take the Sky Train back to the hostel. Anne and I got dinner on the food street. I had pad thai and she had curry. That night we watched Silver Linings Playbook on the projector back at the hostel. Nice to relax with a movie in. I really love teaching with my MTW co-teacher. Today on our way to lunch she told me that she, my other co-teacher, and the students don't want me to go back home when my contract is up. That was really nice to hear, because I don't often hear feedback - positive or negative. Second graders were very well behaved today, compared to other days. I'm not sure why. I went to the post office after work, and then sat at the park reading for almost an hour. I got bananas and sesame leaves from the grocery store to make sam. Metal door/gates (that I didn't know existed) were down this morning in the halls at school, meaning parts of the school were cut off from one another. Today was Science Day, so my classes were cancelled. Thirty minutes before lunch my co-teacher told me we'd have one sixth grade class at 13:00, could I plan some sort of game? I found two powerpoint review games for the current lesson online. Luckily I was limited to only spend a half an hour preparing the class, because when I was setting up just before 13:00 my co-teacher came in and said the class was now cancelled. I got lots of daycare planning done today with the extra time - it was great. Because of Science Day (I think), two of our third grade classes were cancelled, so we only had one. I really love teaching with this co-teacher. I got lots of daycare planning done during the rest of the day. My second grade class at the end of the day was quite small, with many trouble-maker boys. One girl came later. So for next Wednesday I'll try to plan for a small, boy-dominated group. It was an absolutely beautiful morning. One fourth grade class was switched to fifth period and one was cancelled, so I had two planning periods during the morning during which I made a small dent on planning summer camp. Then we had a fifth period class (when we normally have lunch), followed by a late lunch. English teacher's club in the afternoon, the topic was hobbies. I explained what ultimate frisbee was - they weren't even familiar with what a frisbee was. Went for a run after school. 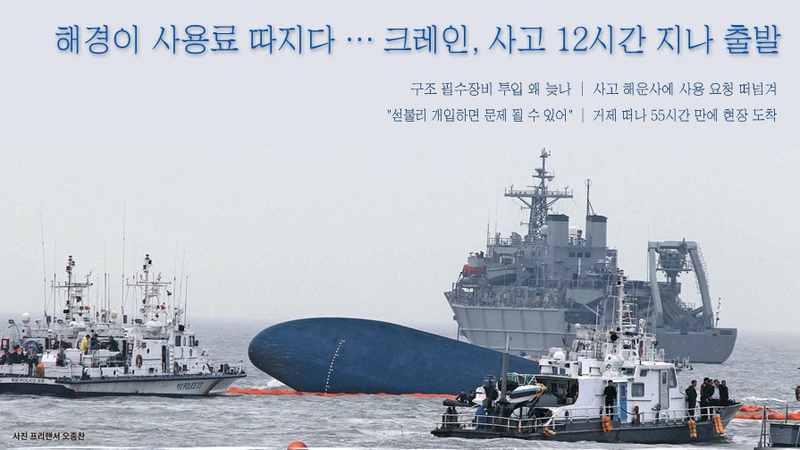 Our fifth graders today were really bummed out, both about the ferry disaster and the fact that their overnight field trip next week is most likely cancelled. I stayed busy all day with my six classes, and just like that - another week has gone by. I threw frisbee for a little bit with some of my young students at the park by my house after school, which was a first. I was mostly worried for the safety of my disc and the boys (one first grader got hit in the nose, and later across the face), so I didn't stay too long. Ever since the new school year (with fresh first graders), my walk to school has changed to the shortest possible route (I love my sleep...). The change came when I discovered a back entrance, so I now walk on a different main road to get to school. (And just last week I found an alley that cuts 30 seconds off of my "commute"!). Coming in through the back gate means that I enter through a side door behind the school. This takes me up a flight of stairs usually full of first graders. Cute, sweet, excited-to-see-me first graders. So my mornings are oh-so pleasant with my short enjoyable walk, and then being greeted by the first graders on my way up the stairs and through the hallway to my office. Today while walking home from school, two young girls (not students I have in class) saw me and said hello, asked me my name, and said "Nice to meet you". And as I said goodbye when the girls left to enter the public library, it hit me. This could very well be the only time in my life that my daily routine (aka job) involves being welcomed by smiles from cute kids at every corner. It's amazing, the happy feelings I get so often thanks to these kids. The students aren't like this when they see a Korean teacher, but I - the native English teacher - am special (At least that's how they make me feel!). Quick disclaimer here: not all students greet me or are happy to see me, but I just focus on how wonderful it is that there are many students who do and are. I'm so thankful for these students, and also this school and its teachers. This post originally appeared on Have Your Health, a blog of mine active from 2013-14, which no longer exists. I'm currently about 40% through Dr. T. Colin Campbell's Whole: Rethinking the Science of Nutrition. Already my eating habits are being affected by the book's argument for a whole foods plant-based (WFPB) diet. I'll address the grand benefits of such a diet in a later post, but first I'd like to write about my biggest shift in thinking regarding nutrition: looking at it from the perspective of a wholeist rather than a reductionist. When I read Michael Pollan's In Defense of Food earlier this year, that was the first time I heard nutrition described from the "wholeism" viewpoint. Prior to that book, I'd always thought of nutrition just as I'd been taught in school and see in society: Each food item in the grocery store is composed of different parts (Carbohydrates, sugars, sodium, vitamins, etc. ), which are all listed on the side of the package. If you're not getting enough vitamin C, you can take a vitamin C supplement. If the product you're buying is fortified with extra iron, great! This is the reductionist view of nutrition, and it's actually not so great. Well, how else could you possibly look at nutrition? Wholeism applied to nutrition means that an orange, for example, is not equal to the sum of its parts. Eating an orange is far more beneficial to your body than taking pills of all the known nutrients in an orange. There's something about the naturally made, photosynthesized energy of a whole plant, for example, that cannot be replicated/replaced by a lab-made nutrient. But the media, government-dictated pyramids and food labels have us thinking otherwise. I was always taught that it's the nutrients inside of a food that make it healthy, not the whole food itself -- which is so backwards. So this "whole" nutrients idea was completely new to me, but makes a lot of sense once you look into it more. To further challenge what I thought I knew about nutrition, Dr. Campbell states that "The food we put in our mouths doesn't control our nutrition - not entirely. What our bodies do with that food does." Huh? Luckily he illustrates the statement with an example. Say you consume 100 mg of vitamin C at one meal, and later 400 mg at a second meal. So your body absorbs four times as much vitamin C during the second meal, right? Wrong! Thanks to the fascinating wonder that is our bodies, this is not the case. Our bodies will only absorb and use however much of a specific nutrient that it needs at that particular moment in time. Incredible! Dr. Campbell rightfully reminds the reader that "Our bodies have evolved to eat whole foods, and can therefore deal with the combinations and interactions of nutrients contained in those foods. Give a body 10,000 mg of vitamin C, however, and all bets are off." And all this time I had thought products with extra vitamins, iron, potassium, etc. were better for me! Turns out whole foods (mostly plants) is the answer so many of us need. I had a creative wind in me today, and after a quick sketch on some scrap paper I then made this G/H flip thing. I'm not sure what to call it, actually (this doesn't qualify as a "lapbook", does it?). I want to make them with my second/third grade after school class either next week or the following week. At first I was just going to use blank paper, but with that many kids there was no way I could help them all get set up if they didn't pay attention (or aren't able to hear/see/understand) when I show how to set it up. So on a blank sheet of paper I drew the horizontal solid and dotted lines, and then wrote each word once in each box. 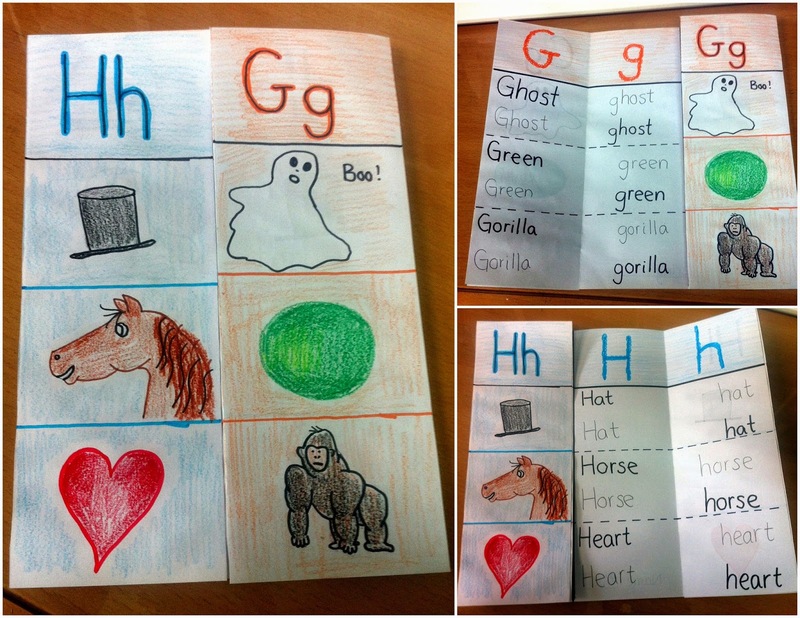 I photocopied that sheet, so this way the kids have something to go from, but can still add a lot on their own. They can trace each word and then write it below, draw all of the pictures, and write all of the big letters across the top column on both sides. That should keep them busy, I hope. We'll see how it goes when I show it to the class. I think it's a neat little thing if I do say so myself, but I'm not sure if the kids will be motivated to make one or not. Yesterday I went to Seoul Forest with some friends, a place that's been in the back of my mind to visit for some time (and also on my "Korea List"). Exactly a week ago a fifth grade girl made me an origami box and ball before English class, and gave them to me with a short note. I opened her note after class and was really impressed with the box she'd made. I wanted to thank her, so I decided I'd write a quick note back to give to her next class (today). 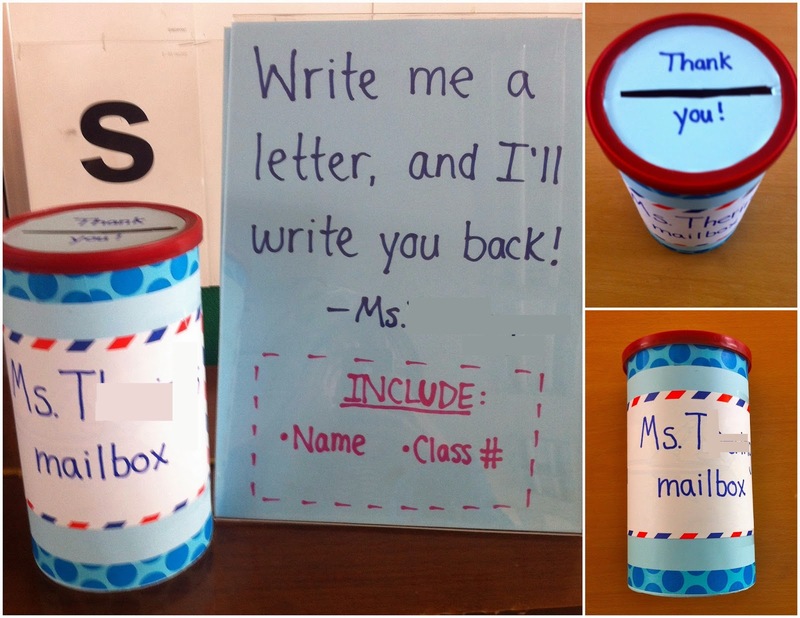 And then the idea hit me: Why not invite all students to write me a note/letter whenever they'd like? Extra practice writing would be good for all of the students, and to use English to communicate with a real person as opposed to answering textbook questions would be very useful. Shyer kids can still have a chance to interact with me, even if they're afraid of talking with me. Also I'm a huge fan of snail mail, so I'd gladly make the time to write back anyone who wrote to me. I could make a mailbox and keep it in the English room! I was so excited. Why hadn't I thought of this until now? So last weekend I got to work right away, and turned an empty oatmeal container into my mailbox. I hadn't run the idea past anyone at school, but on Monday both co-teachers were very supportive of my creation and let me introduce it at the start of each class this week. My Thursday/Friday co-teacher mentioned today that he thinks I should put it by the door (or maybe he meant outside the classroom), so we'll see if its location changes next week. Currently it's sitting on top of the piano at the front of the classroom. I'm also curious to see what kind of traffic it'll get, if any. Time will tell! The recipe blog post described these cookies as a bit weird, and to make when that "gotta-have-something-sweet-must-eat-cookie-now kind of craving hits", not something you'd really serve to guests. So I wasn't expecting much, but I made them tonight for the first time and I am so impressed and pleased with the results! Did I mention they're freaking delicious? I'm feeling really unmotivated and wiped from the week already tonight, but I'm so thankful I saw and made these cookies. They could be a piece to the puzzle towards resolving my digestion disorder, as most chocolate things contain something I shouldn't eat but I think these are a-okay! Today my co-teacher mentioned something about "planting" in the afternoon, but I wasn't sure what he was actually talking about. Then when we had tea after lunch with a few 3rd grade teachers on our floor, it came up again. At 2 o'clock the third and fourth grade teachers had to go outside to plant trees, it sounded like. Two of the teachers were talking about last year's "planting day", saying they had to dig up and plant so many trees, that it was really tiresome. One teacher left around 13:50 to go change, and asked if I was going to go. "Yeah," I said, and he was surprised and laughed it off -- I don't think anyone thought I'd actually go outside with them. Everyone scattered from tea time and my co-teacher left the office to change. From the window I saw some teachers starting to appear outside, so I went downstairs on my own because I didn't want to miss out on this event, which would have happened had I just stayed in the office. I felt a little out of place when I first went down because none of my co-teachers were there yet. Thus I felt like a hinderance because I didn't know what I should be doing, but didn't want to make some random teacher stop their planting work to try and explain in English what I should do. Some of the male teachers I know were taking turns shoveling to plant some small shrubs. They didn't even think to offer me a go with the shovel - that's not a lady's job. I kind of hung around them, then picked up two shrubs when they finished shoveling and moved them two feet off the sidewalk back into the flower bed where they'd just dug the holes. 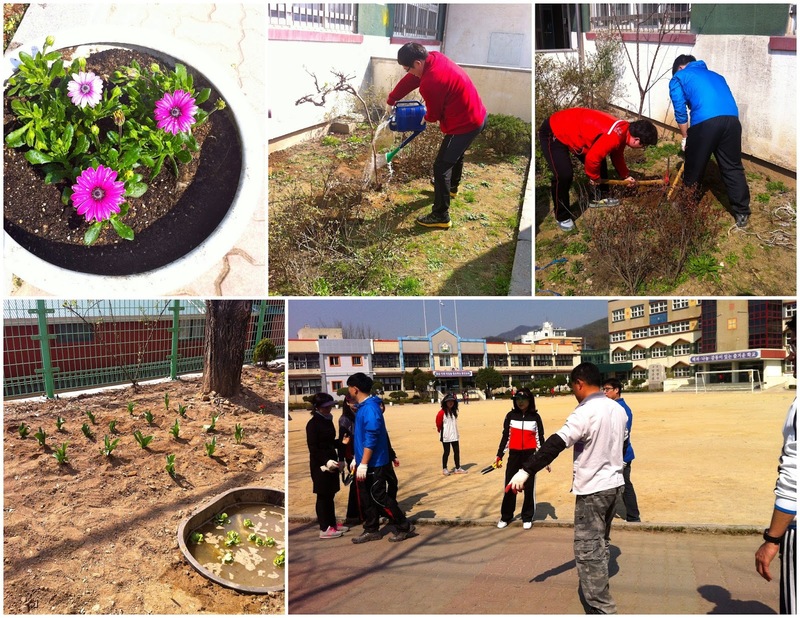 After my co-teacher showed up outside he soon went around to the back of the school with the men (to go do tree stuff I can only assume) and dropped me off with the female teachers who were planting flowers in the pots along the sidewalk in front of the school. Almost everyone - both male and female - had brought and changed into two-piece track/sweat suits. And the women wore those gigantic visors that are quite common here, to keep the sun off of their faces (Look for suits and visors in the below photos). The principal and vice principal were outside for the event, too. Our vice principal had changed into different clothes with a visor, and I hardly recognized her (she's usually really dressed up). Our principal took off his suit jacket, but still wore suit pants and a button-down shirt. After I got going with the flower planting I didn't feel out-of-place anymore. I had gloves and a trowel, and I knew what to be doing! 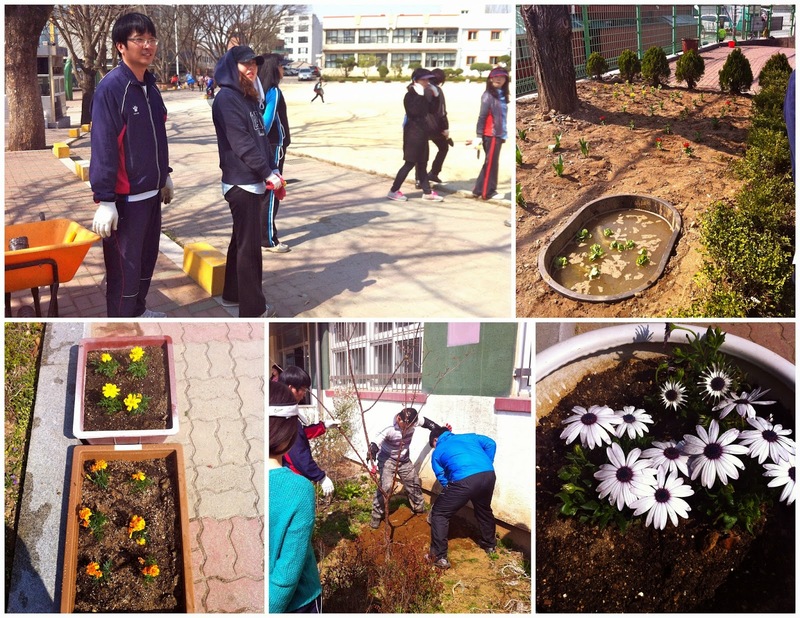 After filling all of the planters along the school, we planted a few rows of different flowers in the dirt by the school's entrance gate. My co-teacher mentioned at one point how good of me to help, because I wasn't being compensated for it (or required by my contract to participate, is perhaps what he meant). But why wouldn't I? A reason to go outside during the warmest part of the day, feel sunshine on my skin, be around other teachers that I don't normally get to see, and do an interesting activity like planting flowers? Win-win-win-win! I did lose some valuable lesson planning time, but I'll catch up. And now whenever I see these flowers and trees around the school yard, they have more meaning to me since I helped plant them. It was a great Tuesday afternoon that caught me completely by surprise. 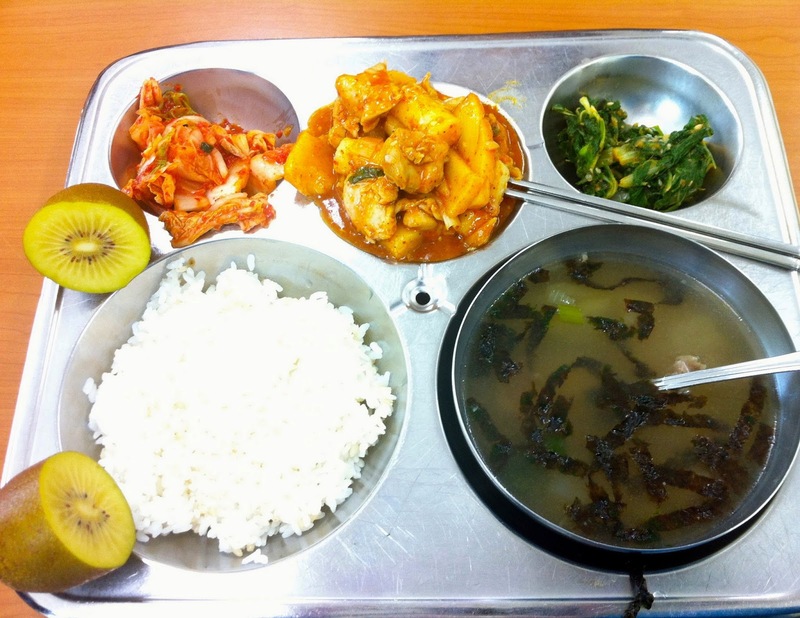 You really never know what might happen during any given day at a Korean school. I've had an on-again-off-again relationship with Dr. Mercola's Probiotic Packs for many years. John introduced them to me when I was first learning about IBS, since I couldn't swallow the big probiotic capsules. When I lived in Spain after college I stopped ordering and taking the probiotics, but then I took them every now and then when I was back in the states last year. See what I mean? On again, off again! I brought a few boxes of probiotic packs with me to Korea when I moved here this past fall, and last October I started to keep track of how many I had each month. Even though I'd decided my goal was to have a probiotic pack every day, my monthly totals for October and November were 10 and 15, respectively. Probiotics on only a third and then half of the days each month. But ever since January 2014, I've taken a probiotic pack every day. It's been over three months of daily probiotics! How did the change happen? Although I'd written that I wanted to take a probiotic every day last fall, it wasn't until January that I became serious about it. Something clicked in my mind and I made it a priority instead of something that would be nice if it happened. I wanted to improve my digestive health, and probiotics would surely boost it. Probiotics were now center stage in my mind, so my conscious helped me make sure I took them every day. I can't drink my tap water here, so I had been buying 2-gallon water bottles from my grocery store every now and then. (Now I boil the tap water and let it cool -- duh!) It was a bit of a hassle these last seven months because I could only get one bottle at a time due to weight and the fact that I was carrying it on my walk home with whatever else I had purchased at the grocery store. Then I'd pour some of that water into a plastic cup at home, dump in a probiotic pack, and use a chopstick to mix it together. The point of these details is that in the back of my mind, it was a bit of a hassle to drink water at home, because that meant more frequent trips to buy the 2 liter bottles at the grocery store. And I do think this affected how often I was taking my probiotics last fall. Now, I have a water bottle solely used for taking my probiotic pack and glutamine each day. I take this empty water bottle to school every morning and fill it up with water from the school's drinking fountain during the day. Right when I get home from school I take the bottle out of my bag and dump in a tablespoon of glutamine and a Dr. Mercola Probiotic Pack, close the cap, and shake the bottle. I carry it around with me for the rest of the night, drinking from the bottle until it's gone. When empty, I put the empty bottle back in my bag so it's ready to come to school with me the following day. This routine has really helped me form the probiotic habit. It developed over time without me realizing it, but I can now recognize that these daily actions are exactly what helped the habit to stick. I doubt anyone's routine will look like mine, but the take away is to pair your new habit with something you already do every day. I keep the probiotic packs in a bowl out on my kitchen counter. I keep the wrappers on the kitchen counter and clear them off at the end of each month. I always see the probiotics, so that really helped me form the habit at the beginning of the year, too. Now it's just a part of my daily routine, like brushing my teeth and getting dressed. This idea can be applied to many other habits. If you want to write in your journal every day, leave the journal on your bed. If you want to do yoga every day, leave your mat out on the floor. Make it easy and accessible. A sixth grader puked during our after-lunch fifth period class. All over his desk, book, pencil case, and floor. It was pink and smelled the worst - even with all of the windows open it was hard to breathe. Holly, the first grade native-English speaker, happened to be behind me at the next table during lunch. I stayed back when the other teachers left and chatted with her while eating my banana. It was so wonderful to converse with her, able to share our woes of "I don't know what they're saying either" with each other. I found out after prepping and going to class that the first two periods were cancelled due to a School Violence activity with the third graders. So I only taught two classes the entire day, but was at my desk lesson planning continuously during the remaining six periods. Our first teacher's English Club meeting of the year was this afternoon. 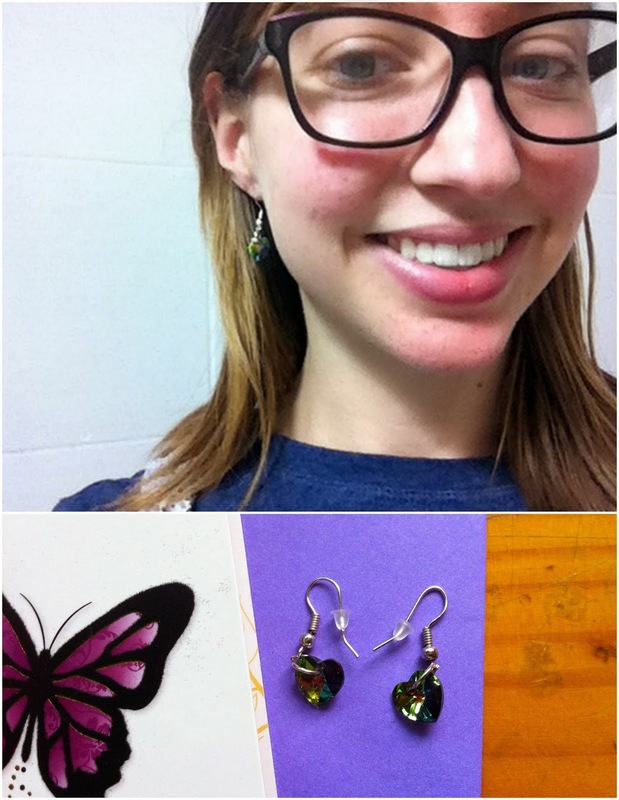 I was happy with it, and wrote about that hour on my Thankful Thursday post. It was a long day, just like Monday (six classes). Some teachers played volleyball from 2:30-4:00, but that's when I was teaching my two after school classes, so I didn't get to watch. Watched two movies tonight, exhausted from the work week. At the end of March I read a post on Brown Ink about a 30 day writing challenge during the month of April: Write On. Since April is National Card and Letter Writing Month in the USA, Write On was initiated by two stationery companies: Hello!Lucky and Egg Press. The challenge is to write one letter every day this month to someone different each day. Thirty letters in 30 days. Hello!Lucky and Egg Press even made writing kits containing 4 letterpress cards that they've been giving away for free! As of today, there are still kits available, so sign up here if you'd like one! (Side note: Mom and Dad, one should be coming to the house for me. You can just leave it in my room, please! It'll be a nice surprise when I come home this fall). On April 1 I decided I'd go for it. Today is April 6 and I've written 6 letters so far, so I think I'm in good shape to complete the challenge. I'm making a trip to the post office on Mondays and Fridays after school this month, mailing them in batches rather than daily. If you'd like to start participating, it's not too late! 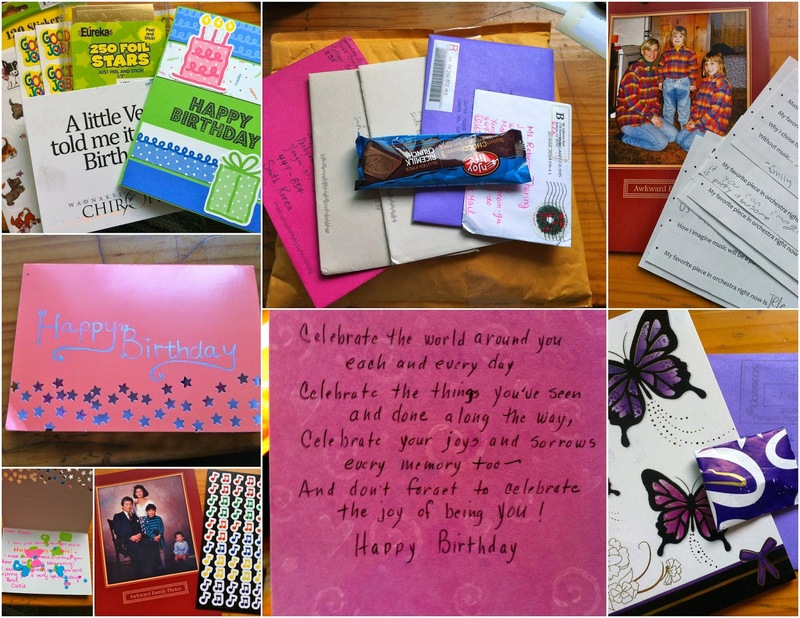 If you don't usually send letters, even writing and mailing just one would be a great way to celebrate the month. If you need ideas for content or recipients, Egg Press is sharing ideas every day on Facebook and Instagram. Want a letter from me? Leave a comment and let me know, I'll write to you! If I don't have your address, send it to me via email (rebewithaclause [at] gmail [dot] com). Happy letter writing! You can find all of this month's carnival posts here. Prompt: Write about one of the biggest myths you discovered while teaching abroad. Before I began teaching abroad in 2011, I hadn't quite realized that was actually something one could do. I didn't know about all of the opportunities worldwide for native English speakers to teach English - it simply hadn't been on my radar. So I didn't have (or hear about) any preconceived ideas about what teaching abroad entailed. 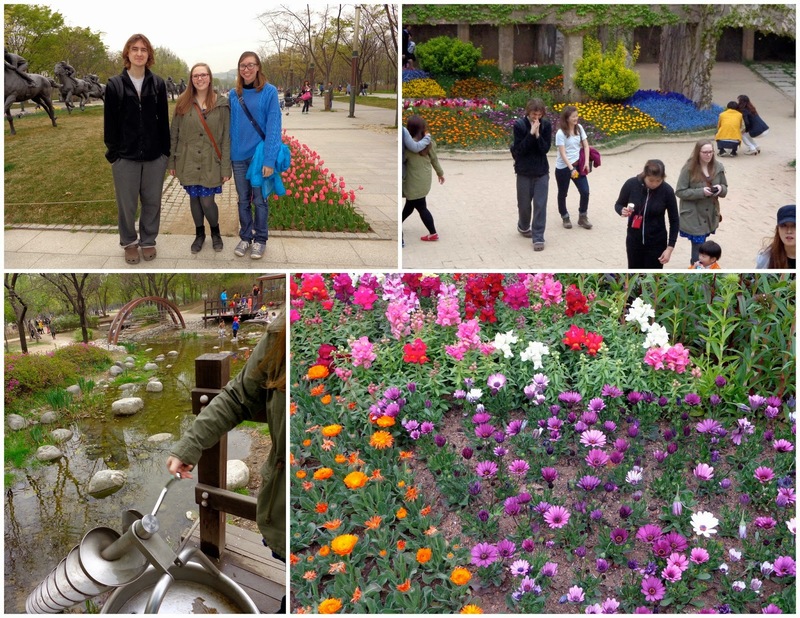 I learned about teaching abroad by doing it myself, both in Spain and currently in South Korea. So while I'm not sure exactly what folks back home may think about teaching abroad, there is one myth I've come across enough times that I'd like to single it out now and prove that it is, indeed, a myth. 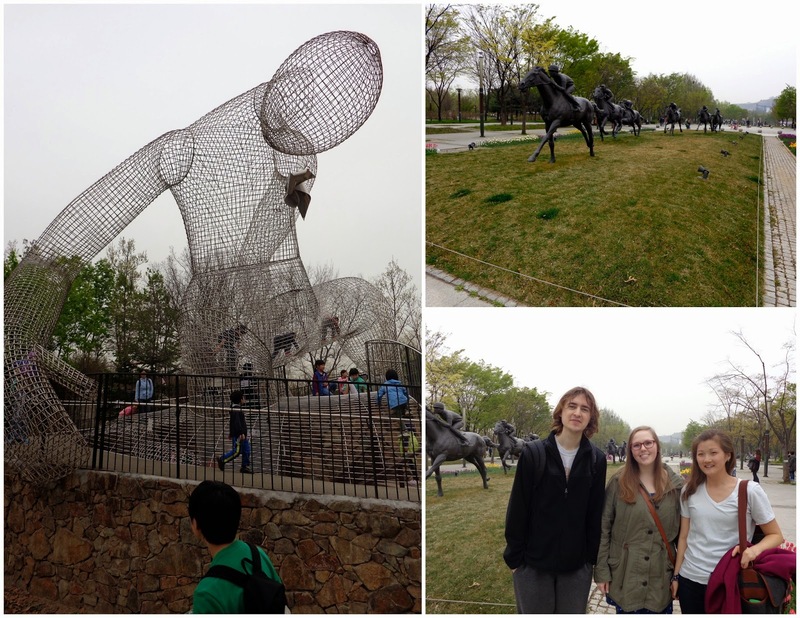 Part A: When you teach abroad, you're on a vacation from "real life" - on a trip of sorts. Part B: When you live abroad (whether you're teaching or not), you travel all the time. When I returned to the states after my second year living in Madrid, I had a really hard time with reverse culture shock. One of the questions I hated getting was "How was your trip?" Ahh! "It wasn't a trip!" I wanted to scream. I had a life! A job! Bills to pay, an apartment to keep clean! I was not just passing through, that's where I lived. It's my second home. 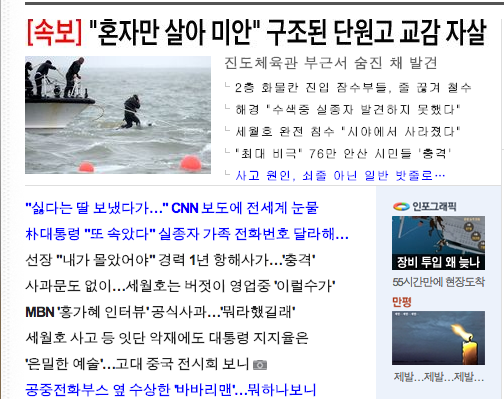 Just this past week I blogged in detail every day about that day's happenings (along with five other UW grads teaching in Korea) partly so others would know what my days are actually like. I wake up, go to work, come home exhausted and try to do something productive before it's time to go to bed and do it all over again the next day. That's not a vacation, it's my real life. (I'll use Madison, WI as an example because many of my readers can relate, but replace "Madison" with the name of the city you live in while reading.) Think about your life in Madison, your daily routine. Now take a German and plop him/her in your place. He or she is living abroad in Madison, WI this year. But what they see/do each day is exactly the same as what you see/do each day. Eat breakfast, watch the news, go to work, do laundry, get dinner with friends, watch football on TV. Does it sound super exciting? To the German, they are living abroad, but their daily routine can easy be very much like yours. And while yes, many small daily interactions might be more interesting to the German, they're still your daily interactions. And let's say the German's friends back in Germany idealize their friend's life in Wisconsin. America, the land of opportunity! A foreign country, so exotic. But the life they're idealizing is your life. Now reverse that scenario. Take an American and set them into someone's life in Germany. The life may not feel (or be) especially grand to the German, but when viewed by the American's friends who haven't lived abroad, it may have a vacation-y feel to it. Like going to Hawaii or Thailand. I'm even guilty of idealizing lives once I hear the country's name, though I know from the insider's view that it's not as amazing as it sounds to me during those introductory conversations, so I can take a step back and snap myself out of it. Teaching abroad surely is amazing in its own way, but not at all in the way that many view it to be. Teaching abroad does not mean you're on vacation. You're working and living, much like natives in that country work and live (which is like your life, dear reader: living and working as a native in your home country!). And does your daily life provide ample time for travel? That's the next part of this myth I'd like to focus on. I recently got an email from a friend from my last job, and he said "Doing a lot of traveling, I would assume?" I replied "No, actually not much traveling. It's a full time job and I live in a rural town, so some weekends I don't even go into Seoul (takes 1.5 - 2 hrs to get there by bus)! Usually I do laundry, read, cook, write, watch TV, clean up my room... boring normal things that you could do on a weekend in Madison." I did spend 10 days in Bangkok during my school's winter vacation, but apart from that I've just been here. Yet for whatever reason, living in a foreign country is often equated with travel. While I do enjoy traveling, I have not been doing much of it these past seven months. I have a limited number of vacation days that can only be used when the school is on vacation. Apart from those days, I'm expected to be at work, just as you would at any other job. Perhaps other teachers abroad are traveling more than me, but it really depends on your hours and location. When I taught in Madrid it was much easier to go places on the weekend because I didn't work on Fridays and I lived in the city, which meant I could easily get to bus stations/airport via the metro. So I did more traveling while teaching in Madrid than I'm doing now in Korea, but I'll still stand strong saying that Madrid was my home, not my home base. I spent way more weekends in Madrid than I did elsewhere, and my weeks consisted of the monotonous work routine. You do travel while living abroad, but not all the time. And one final consideration with all of this travel talk: If I'm in Madison and go to La Crosse or New Berlin for the weekend (these are in Wisconsin, USA), most Wisconsinites would not consider that "traveling". However when living in Madrid, if I'd go to Valencia or Alicante some weekend, or even nearby Toledo for a day-trip, it is considered traveling. Oh the joy of perspectives! Teaching abroad is different from living in your home country, but it is not an extended vacation filled with endless travel adventures. It's real life, just like the lives of natives in that particular country, only with the extra struggles of being an expat. Your days can just as easily blur together: going to work, teaching class, lesson planning, walking home, grocery shopping, cooking, washing the dishes, etc. But the accumulation of these daily activities during your time teaching abroad will forever change your view of the world, which is why I find myself a teacher here in Korea at this very moment. This afternoon (after my daycare class) was the first meeting of the teacher's English Club this school year. In addition to one of my co-teachers (who runs the club), five others were in attendance. I'm not required to go (It's not an extra class I get paid for), but I love to help and encourage others, and this English club gives me the perfect set-up to do just that. It's also a great chance for me to get to know some of the other teachers that I never get to interact with on a regular day. I'm so thankful that I have this opportunity at my school. I really hope we continue to meet regularly on Thursdays, and that attendance remains the same or increases. I really admire and am grateful that these teachers are putting themselves out there into the uncomfortable situation of speaking English in the club - especially in front of a native speaker. I'll continue to try to be as encouraging and supportive as I can. Started buying bananas regularly and eating two a day (one for breakfast and one when I get home from work). As pathetic as this may sound, I started doing this at the beginning of March, but had to wear my wrist brace for a few days in a row soon after, which prevented me from doing more push-ups. My wrists aren't strong enough for push-ups! I've written and published 3 posts this month, not necessarily on Tuesdays whoops. Joined a health forum specific to my main ailment and shared my health history post. Already explained why I had to drop this. My poor wrists! Started Give it 100 project to increase flexibility in my legs. Goal is to be able to touch my toes. Did yoga 4x this month. Went on two runs near the end of the month. Know the dates that Herm's parents are visiting London. I currently have an 18-day streak on Duolingo! Leveled up to Level 9 this month, too. Take probiotics and glutamine every day. Publish one post a week. Write post about Whole: Rethinking the Science of Nutrition after reading it. Spend an hour each week reading/learning about retirement funds and Roth IRA investing. One Korea list item and see the cherry blossoms. Write a letter every day in April (#Write_On) in honor of National Card and Letter Writing Month. I suppose this could fall under my "Unplug more often" category, as I'm certainly unplugged and in the zone when I write letters and decorate envelopes. What's one thing you'd like to focus on in April? If you made resolutions this year but they've fallen by the wayside, pick one up today! It's not too late.